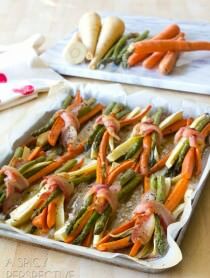 Looking for ways to lighten the oven load this Thanksgiving? Try our rich herby Slow Cooker Thanksgiving Stuffing made right on the countertop in a crock pot! It’s the plight of Thanksgiving dinner… How can you possibly make all the wonderfully cozy dishes you’ve added to your menu, with only one oven and four stovetop burners? Or… You can look to your slow cooker for answers! Slow cookers (AKA crock pots) are a fantastic solution for all sorts of dinnertime dilemmas. Think beyond the beef stew and Mexican casserole you usually throw in your crockpot. The humble slow cooker is capable of so much more. And the beauty is, most of us have at least one crock pot hidden in our pantry. Often two or three. 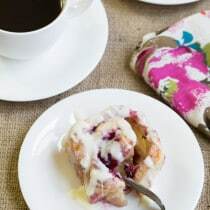 Over the years we’ve made yeast rolls, quiche, spiced apples, beef tenderloin, wassail, creamed spinach, creamed corn, and all sorts of unconventional things in the crock pot. This frees up oven and stovetop space. 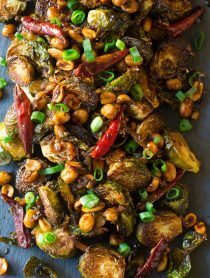 Just imagine all the Thanksgiving side dishes that are potentially slow cooker-friendly. 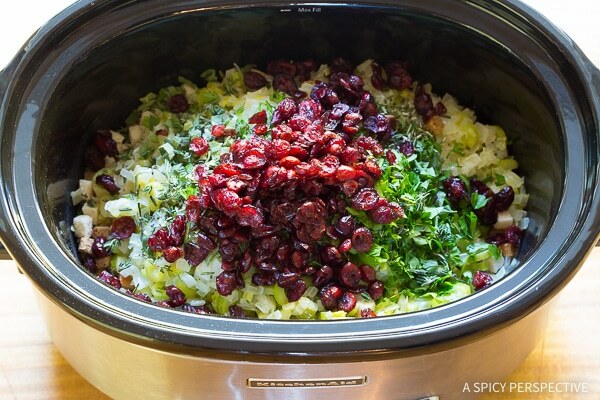 Can I Cook Stuffing In A Slow Cooker? Oh, yes! It’s actually my preferred method, because it keeps the stuffing so moist. Generally speaking, stuffing will “bake” in a crock pot for 2-4 hours on high heat, or 4-6 hours on low heat. Then set the slow cooker to warm and leave it, until it’s time to serve. 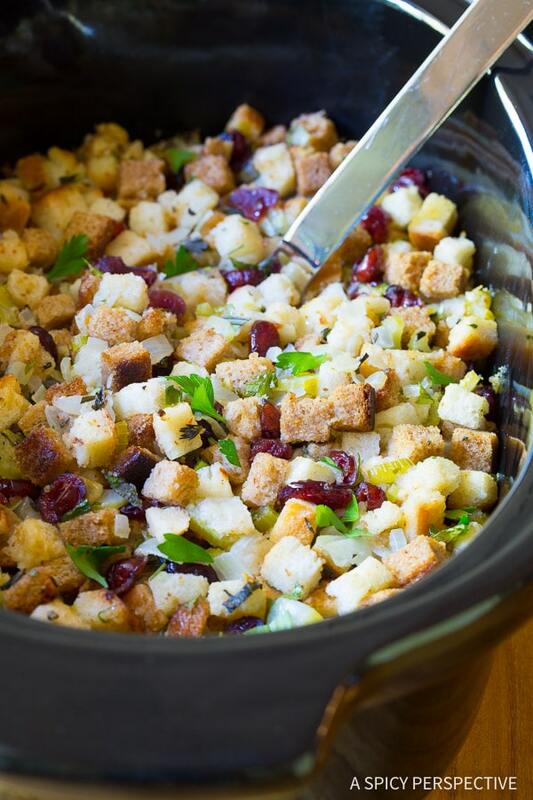 Let’s start with my favorite Slow Cooker Thanksgiving Stuffing recipe, shall we? 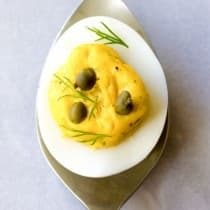 This is a classic dressing recipe loaded with butter and herbs. Prep the Bread – I usually start with store-bought unseasoned bread cubes, because they are quick to use and easy to find this time of year (You’ll find them in the seasonal Thanksgiving section at your local market.) However, you can cut day-old bread into cubes as well. 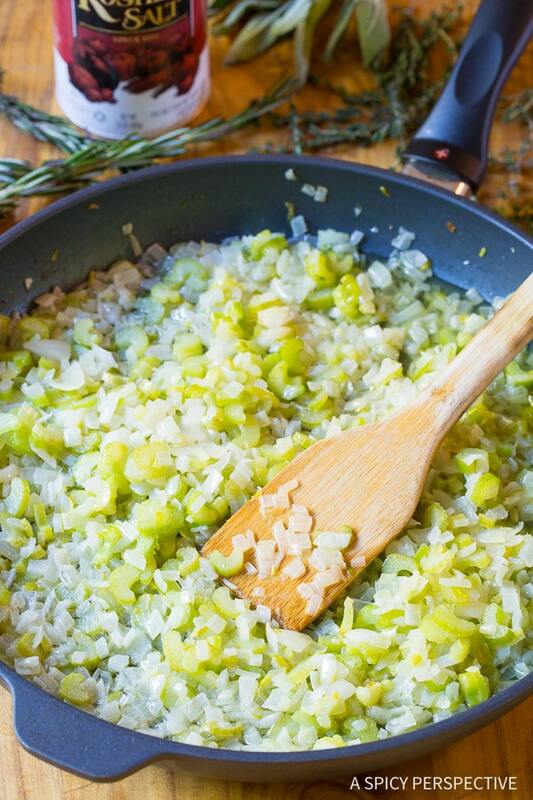 Sauté the Vegetables – Then add fresh herbs like parsley, sage, rosemary, and thyme, along with sautéed onions and celery. If you are cooking something in the slow cooker for 10-12 hours it’s sometimes unnecessary to sauté the onions first. But in this case, it softens the texture and sweetens the onions so they don’t over power the stuffing. Combine – Add all the dry ingredients for the Slow Cooker Thanksgiving Stuffing to the crock, then whisk chicken broth and eggs together and pour over the top. Slow Cook – Cover the crock and let the Slow Cooker Thanksgiving Stuffing cook for several hours. You can turn it on low or high to match your cooking timeframe. The rising moisture gathers against the lid and drips down over the stuffing the entire time it cooks. Because this crock pot stuffing recipe is made with all fresh ingredients, it’s important to season it well with salt. I like to sprinkle a generous amount of Diamond Crystal® Kosher Salt over the top to bring out the natural flavors in the other ingredients. It makes the butter soaked bread cubes taste butterier. It makes the herbs taste even more fresh and green. It even makes the cranberries taste sweeter. Good salt is the magic ingredient in any recipe. What you end up with is a super moist and fluffy traditional Thanksgiving stuffing that is utterly irresistible. Who even needs the rest of the Thanksgiving dinner when you have stuffing like this? 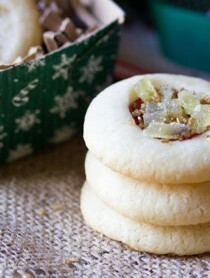 Looking for more holiday recipes with a salty note? 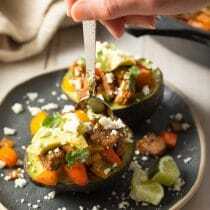 Check out our newest Pinterest Board, Brilliant Time Saving Recipes! All our sweet and savory favorites are represented, along with amazing tips on how to make the most of sea salt and kosher salt. Follow Diamond Crystal® Salt on Pinterest for perfectly seasoned recipe ideas! 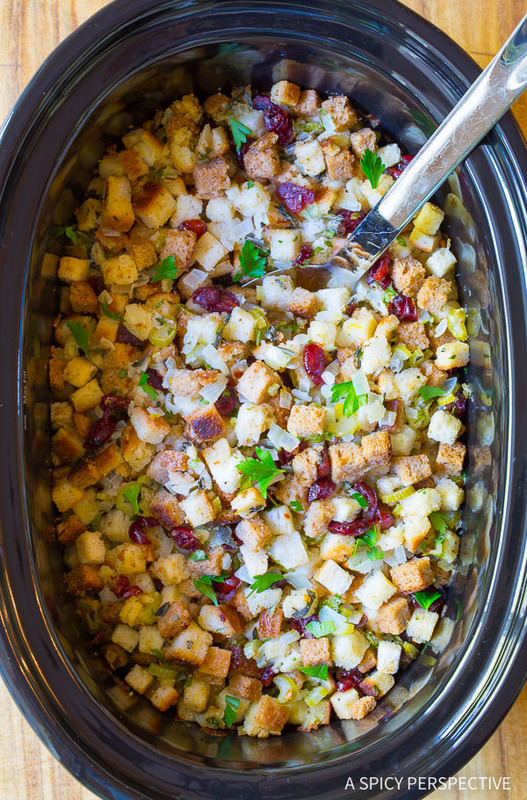 Easy Slow Cooker Thanksgiving Stuffing Recipe to keep your oven and stovetop open for other dishes! 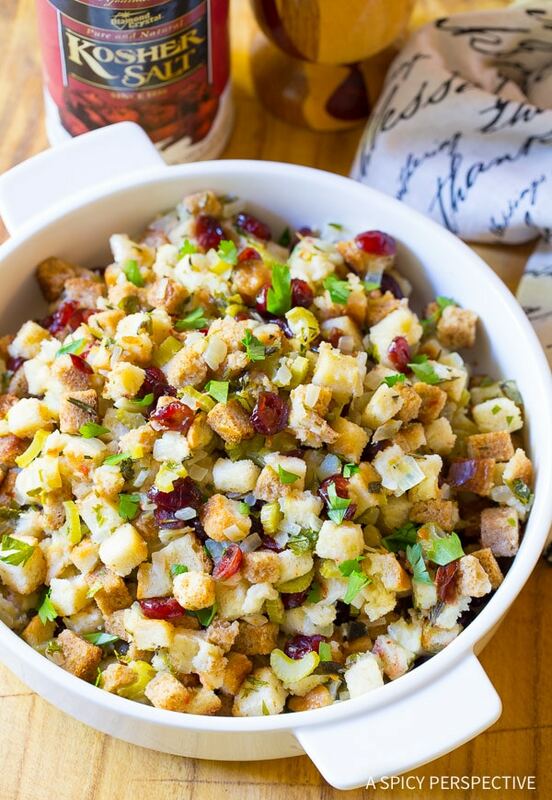 This Crock Pot Stuffing is utterly amazing. Place the butter in a large skillet and set over medium heat. Once melted, add the chopped onions and celery. Sauté for 3-5 minutes to soften. Meanwhile, chop all the herbs and whisk the chicken broth and eggs together. 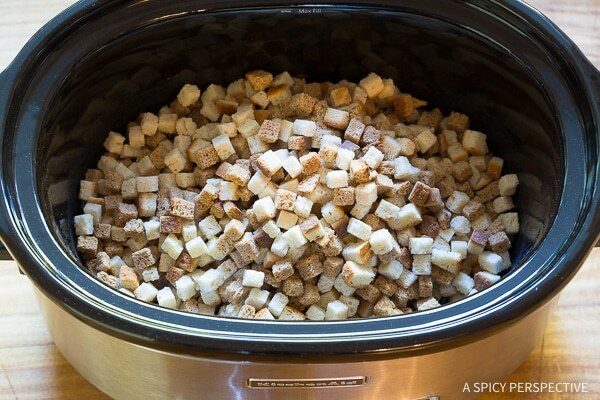 Pour the dried bread cubes into a large slow cooker. 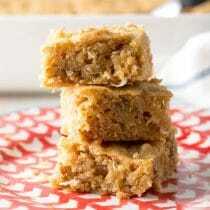 Once the onions and celery are soft and sweet, scoop them over the top of the dried bread cubes. Add the chopped herbs, dried cranberries, 2 teaspoons of Diamond Crystal® Kosher Salt, and 1/2 teaspoon crushed red pepper. Pour the broth and egg mixture over the top. Gently mix to coat. Cover the slow cooker and turn on high for 2-4 hours, or low for 4-6 hours. If you leave the stuffing on too long, and it starts to dry out, add a little more chicken broth to soften. You can substitute 4 teaspoons sodium-free poultry seasoning for the fresh sage, rosemary, and thyme. Keep the stuffing on the crock pot "warm" setting when it's done cooking. Disclosure: This post is sponsored by Diamond Crystal® Salt. All opinions are our own. Made this for family Thanksgiving and was well received. The only alteration I made was that I used turkey flavored stuffing. Some people couldn’t help but take some taste tests “to ensure that it was still good”. Dried herbs shrink up really small, then expand when reconstituted. Therefore, 1 tablespoon of fresh herbs = 1 teaspoon dried. Does that make sense? I did a test run by making a half portion and I used about 3/4 of a cup of roughly chopped fresh cranberries in place of the dried cranberries. It came out wonderfully! I couldn’t stop eating it! That’s how I know it’s good – stuffing has always been one of my favorite dishes at Thanksgiving. I put in a little less than 1 tsp salt, and think I will reduce it even more for the big day. I found it to be a bit too salty. I loved the use of kosher salt. Can you add pork sausage? Should you brown it first? If using dried herbs/spices, what would be the equivalent? Can you double this recipe in the large slow cooker? One just won’t be enough! Thank you so much for posting this, it will be such a time saver and life saver for me. We do Christmas at the families, and we just do sandwiches. I really like to have a dinner, but am not home to make it. This will be a great help! Pingback: Menu Plan Monday ~ December 19/16 Christmas Edition! This is the best stuffing I ever made and super easy. I skipped chopping up the herbs and just used dried. What kind of cranberries do u use? The soft moist ones or the bag of dried? How can I keep the edges from burning? I made a trial run tonight. The flavor was fantastic. But the edges burned after less than 2 hours. Any suggestions or tricks? Maybe give the stuffing a stir a couple times. You must have a hotter-than-average crockpot! I’ve made this is several different slow cookers and the edges get a little crusty, but do not burn. Another idea is to line the crock with parchment paper. 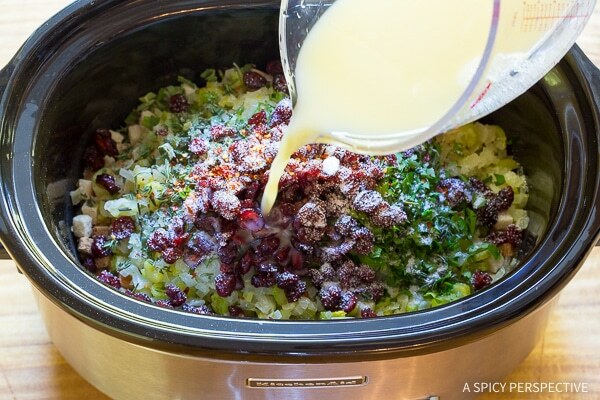 Absolutely love the idea of making the stuffing in the crock pot! It’s beautiful! So so smart!! 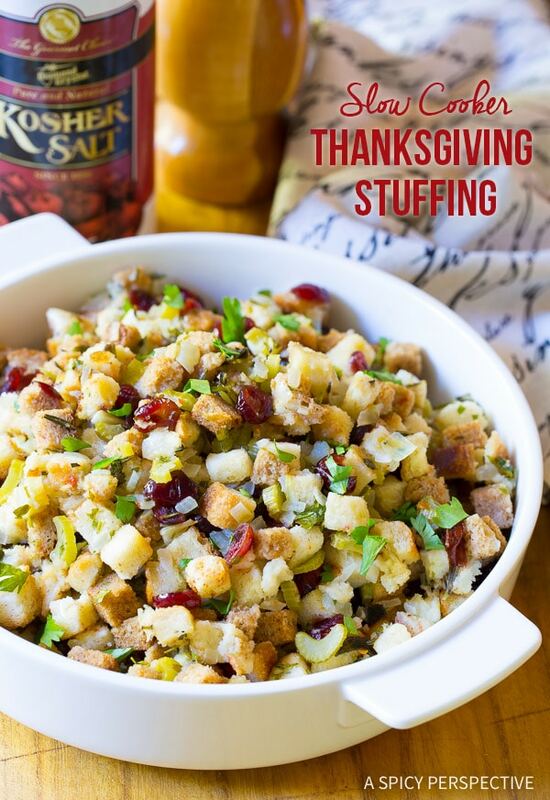 I love everything about this stuffing, especially that it can be made in the crock pot. Great for pot lucks! I love anything I can slow cook!! Gorgeous flavors and colors Sommer! What a great idea. Genius! Anything to free up oven space. this is gold! anything I can do to free up some burner space for the holidays is key!